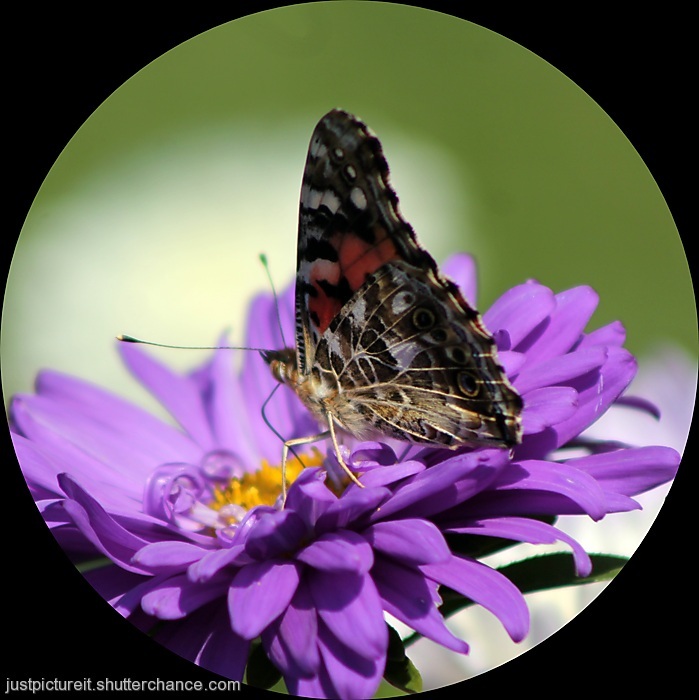 During the first and second weeks of September the island experienced hundreds of thousands of painted lady butterflies on their migration route. They were everywhere! When driving you were both driving over them and hitting them with the windshield. It was quite an experience. They loved the asters in the garden and also the dirt in the driveway. They are known to be a pest of soybeans but it is only in their larval stage that this is so. Right now they are feasting on the most predominant weed at this time of year, goldenrod. There are still plenty of these butterflies around but not in the great numbers of those first two weeks. Jolis macros de ces jolis papillons. What a wonderful invasion that must have been!!! Lovely photos! Mary MacADNski: I have been thrilled by the experience. It is a very fine image, Mary. Mary MacADNski: I have several hundred to choose from. Mary MacADNski: Several areas in the world were inundated with them this year. Mary MacADNski: This is very true - completely different too. Everybody seem like butterflies, so a plague of them is thought quite pleasant. Mary MacADNski: No one had seen anything like it before. It was wondrous. you got some gorgeous beauties here, Mary. it normally takes me a lot of effort to get these shots. Mary MacADNski: I mentioned not long ago that I find insect shots difficult. Not with this phenomenon though. That must have been a wonderful sight. Lovely pictures Mary. Mary MacADNski: You can believe I might have plenty more. I've heard of his migration, how wonderful to experience it first hand! Mary MacADNski: Several areas of the world experienced it this year. Two terrific images Mary. I would have loved to have seen even one of these in our garden this year. Mary MacADNski: It certainly was a delight and there are still plenty around.